The US has observed a moment of silence for the 26 victims of the Connecticut school shooting, as a gun lobby group called for armed security at schools. Bells in Newtown tolled 26 times, one week after 20 children and six adults died at Sandy Hook Elementary School. In Washington, the National Rifle Association called for “good guys” to be armed for “absolute protection”. Adam Lanza, 20, carried out the attack at 09:30 EST (14:30 GMT) after killing his mother. He later shot himself dead. Funerals for those killed have taken place throughout the week, and continue in Newtown on Friday. Connecticut Governor Dannel Malloy has asked people throughout the state to join the moment of silence, and churches in many other states also rang their bells 26 times. The governor, with his deputies, marked the moment on the steps of Edmond Town Hall in Newtown. In Washington on Friday, influential National Rifle Association (NRA) broke a week-long silence with a robust defence of its pro-gun position . ef executive of the NRA, criticised politicians who had “exploited” the tragedy in Newtown for “political gain” and took aim at laws designating schools as gun-free zones. “They tell every insane killer in America that schools are the safest place to inflict maximum mayhem with minimum risk,” he said. Mr LaPierre called for a national database of the mentally ill and blamed violent video games and films for portraying murder as a “way of life”. He spoke out against the media for demonising lawful gun owners, and for suggesting a ban on certain types of weapon would be effective. “The only thing that stops a bad guy with a gun is a good guy with a gun,” Mr LaPierre told reporters. Congress should authorise funding for armed security in every school in the country, he said, adding that an “extraordinary corps” of trained professionals could be drawn from active and retired police officers, security professionals and firefighters around the country. Governor Malley had called for a day of mourning. It seems the weather obliged. The rain has been pouring down for hours. When the moment of silence came at 09:30, the governor and the town’s dignitaries stood huddled on the steps of the town hall – a pretty, quaint New England building. The rain and winds swirled around them. Across the street the Episcopal church rang its bell 26 times. Further down main street, the employees of the local bank stood on the porch in silence. People stood stock still in the street and got drenched. The silence lasted for 10 minutes, which is how long it took Adam Lanza to kill 20 children and six adults at Sandy Hook elementary school just one week ago. 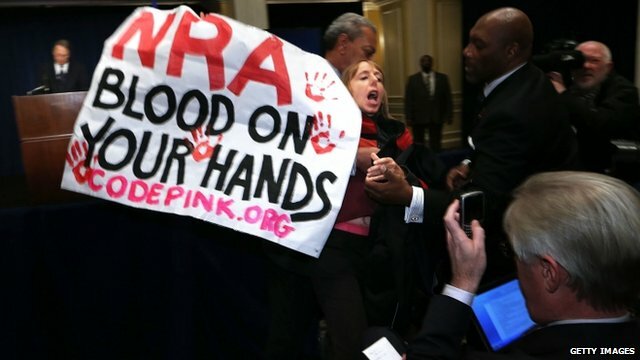 Mr LaPierre was interrupted twice by anti-gun protesters carrying banners and declaring that the NRA had “blood on its hands”. Afterwards, New York Mayor Michael Bloomberg, who is an advocate for tighter gun control laws, said the NRA’s response was “a paranoid, dystopian vision of a more dangerous and violent America where everyone is armed and no place is safe”. The guns used in the shooting had been legally bought by the gunman’s mother, Nancy Lanza. The shooting has seen some pro-gun congressmen say the mass shooting has prompted them to change their views on whether guns should be regulated more strictly in the US. Meanwhile California Senator Dianne Feinstein, who has been an advocate for tighter gun laws, said she would introduce new legislation when Congress meets for the first time in the new year. But there is no bipartisan consensus on the issue, with others backing the NRA line that teachers in schools should be armed in order to better defend students if a shooting occurs. In Connecticut, Governor Malloy has called Friday a “day of mourning” and invited the governor of other states to participate in the acts of remembrance. President Barack Obama said he would observe the tribute to the shooting victims privately. Since the mass shooting, the Obama administration has indicated that it will look for ways to tighten gun laws in the wake of the attack. Vice-President Joe Biden has been assigned to lead the response to the Sandy Hook massacre, and Mr Obama has demanded a set of “concrete proposals” within a month. Speaker of the House John Boehner has said the Republican-controlled chamber would consider new proposals. Mr Obama has said he would support reinstating an assault weapons ban that lapsed in 2004. The White House has also suggested the president would back other gun control measures on high-capacity ammunition clips and closing loopholes that allow people to buy guns without background checks.